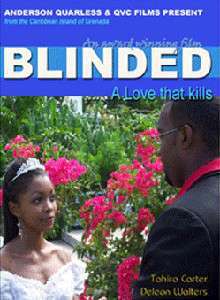 Blinded (2006) is a Grenadian feature film about domestic violence directed by Anderson Quarless and starring Deleon Walters and Tahira Carter. It was the first full-length film entirely produced in Grenada. Clara (Tahira Carter) meets John (Deleon Walters) at a particularly vulnerable time in her life. She is "blinded" by love and he becomes her world. The intense relationship then becomes violent and Clara is forced to take drastic action to protect herself and their son Chris. This film has an entire local cast and crew, and was filmed in a various locations throughout Grenada, Carriacou and Petite Martinique including beaches, waterfalls and other scenic locations. The movie premiered to Grenadian audiences on January 28, 2006 at the Grenada Trade Center and February 4, 2006 at St. George's University. The movie received international recognition when it was selected for the 2007 New York International Independent Film and Video Festival. ↑ Thomas, Kishawn (2005-12-12). "First-ever Grenadian movie produced on domestic violence". Caribbean Net News. Retrieved 2007-11-09. ↑ Thomas, Kishawn (2006-01-31). "Premiere of Grenada's first movie". Caribbean Net News. Retrieved 2007-11-09. ↑ Thomas, Kishawn (2006-04-06). "Grenadian movie gets international recognition". Caribbean Net News. Retrieved 2007-11-09.